For a long time Barnes & Noble, the United States’ largest bookstore chain, was the bully of bookselling. 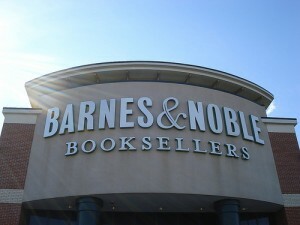 B&N was the bookseller whose massive expansion into superstores in the ’80s and ’90s was seen as the catalyst for the closure of numerous independent booksellers across the country. They were the booksellers who absorbed much beloved small chains -– Doubleday Book Shops and Bookstop, among them -– and systematically closed them down. They were the bookseller who moved aggressively into college stores and gutted them of their serious academic titles in favor of higher margin sidelines and sweatshirts. They were the booksellers who wanted to WIN! It’s time to say it: Barnes & Noble may be the last, best hope for American bookselling. When you talk to publishers, they too had mixed feelings. B&N’s co-op was a pricey, but necessary evil –- how else would people find your books amid all those other titles, and the company’s fiction book buyer -– She Who Cannot Be Named – was perhaps too powerful. SWCBN could make or break a novel with a single order and was said to be so influential that she could all but order a jacket to be changed to suit her fancy. Even their corporate culture seemed a bit belligerent. I remember sitting through stockholder meetings while B&N execs did their best to muster some charm, but all they could do was scowl. And I’d be remiss in not mentioning the time a B&N exec called a meeting with me and my editor at Publishers Weekly, where I worked in 2000, for the sole purpose of screaming at me about a critical news item I’d written about the company. That meeting ended with the exec tearing up a print out of what I’d written and throwing the resulting confetti in my face . . . These days, all the grumbling is about Borders, America’s second largest chain, which is flirting with bankruptcy (again!) and Amazon, which has for the last decade or so taken on the role of Bully-in-Chief. You don’t hear so much complaining about B&N. Why? The company now stands as perhaps the last, best hope of American bookselling. Sorry Indies, but it’s the truth. B&N still has enough consolidated power to “make” books. Its buying power makes it indispensable to publishers who need advance orders to justify print runs and the various other knock on effects that entails. They are providing –- via their Nook device –- the biggest rival to Amazon’s e-reader hegemony. And, let’s face it, if they –- along with Borders -– disappeared, how many communities would suddenly be underserved or not served at all? This is the reason small towns lobby B&N to open stores in their community: people are now, like it or not, accustomed to the selection available at big box retailers. True, perhaps half of those who shop at B&N’s aren’t there for the books, but what better chance is there to entice a not-so-avid reader into picking up a book? I live in Houston, the fourth largest city in the United States, which has only two independent bookshops of significance -– Brazos Bookstore and Blue Willow Book Shop — as well as a premier independent mystery bookshop, Murder by the Book. The distance between the two indies takes a good 45 minutes to drive, in decent traffic. And the mystery shop happens to be all but across the street from one of the indies. What else is there? Well, there is a brand spanking new Barnes & Noble that’s a ten minute drive away, and several older locations (and several Borders –- though for how long remains to be seen). And before you suggest that it’s just Houston, please note this is the same situation in all the big cities throughout Texas -– Dallas, San Antonio, and yes, even Austin -– and in many other cities across the United States. (And before you suggest it might just be Texas, let me point out that some 45,000 doctors work and live ten minutes from where I’m sitting). Now, I’m not going to tell you that I do all my shopping at B&N -– I don’t have a B&N frequent shoppers card, for example. But it bears pointing out that convenience is often in conflict with my loyalty to the indies -– and with an impatient three-year-old strapped into a car seat in the backseat, convenience all too often wins. And here’s the rub: the more time I spend at B&N, the more I’m impressed by the way the company’s culture has evolved and, indeed, changed. When I lived in New York several years ago, shopping at B&N’s flagship Union Square store -– which was on my way home from work -– was my option of last resort. The staff were at best indifferent and at worst impatient and hostile. I found much the same at B&N stores when I moved to Texas in 2004. Now, things seem different. The employees may not know where every book in the store is, but they do show a willingness to try and find it for you. Some chat with you. When I recently bought a NookColor and was thoroughly impressed with the way the staff handled the “sale”: I’m no noob, but they were patient enough to show me several features that were unique to the device, such as the magazine “article view” (which, while nice, doesn’t work well on pages with multiple short items!). What’s more, the salesman showed actual enthusiasm for what he was selling and even handed me a business card and told me to phone him if I had follow-up questions. (And, no, I didn’t mention that I was a publishing journalist). There have been other signs that the culture is changing as well: Len Riggio talking to NPR about the state of the book business and sounding pleased to do so; the NookColor winning the People’s Choice Award at the “Last Device Standing” competition at CES; the completely unexpected Christmas card I got from B&N’s regional director; and their innovative co-promotion with Esquire magazine this month where model Brooklyn Decker appears virtually in the stores. It seems as if B&N has realized that if the company is going to have a virtual monopoly on chain bookselling and hopes to keep those customers from migrating online, it must be more user-friendly and solicitous. And all this change in attitude seems to have happened amid the acrimonious power struggle between Len Riggio and billionaire investor Ron Burkle that took place throughout 2010. This is why, when I learned yesterday, that the company had laid-off some 45 staff -– including several long-standing executives and book buyers (but not She Who Cannot Be Named), I was struck with dismay. The news came after the company claimed to have one of their best holiday seasons in recent years. This is exactly the type of behavior Borders has been engaging in for several years. In fact, Borders has had so many executive level staff changes over the past five years, it’s been nearly impossible to keep track of who’s-in, who’s-out and who’s barely holding on –- and lord only knows how much severance Borders must have paid out during that time. Should we be worried about Barnes & Noble, too? Is good customer service actually incompatible with profitability? After all, isn’t it logical to assume that your best customers are already familiar enough with your store to shop on their own, and those that need the most help are likely the one’s who shop there the least? Does B&N’s shedding of buyers signal that the company was top-heavy all along and is looking to streamline operations, perhaps to make it more attractive to a buyer? All we know is that if American bookselling (and publishing) wants to thrive –- and have some leverage to work against Amazon, Google and others who might desire their own hegemony — B&N must survive. If there was ever a case that proved competition is healthy for business, this is it. Long live B&N, Borders, the Indies, Amazon…and all those publishers who depend on them to sell their wares. DISCUSS: Will Independent Bookstores Survive Without Selling E-books?